Watch Live Baltimore Ravens vs Atlanta Falcons Thursday Night NFL Week 10 Picks & NFL Week 10 Predictions- Week ten of the 2010 NFL Picks season begins with a Thursday night Predictions affair featuring two of football elite teams during the first half of the season as the Atlanta Falcons (6-2) versus the Baltimore Ravens (6-2). Vegas Odds makers has installed the Falcons as -1 point favorites at home in this non-conference match-up. The Falcons, first in the NFC South, edged out the Tampa Bay Buccaneers last week, 27-21, and have won six of their last seven NFL Predictions games. Atlanta runs the ball effectively with Michael Turner who has rushed for 694 yards and 5 TDs, including three touchdowns last week against the Bucs. 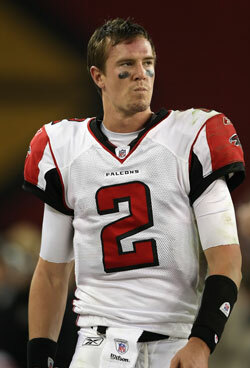 Matt Ryan has been effective as a passer, throwing for 1,949 yards and 13 TDs. His main man is WR Roddy White (58 catches for 796 yards) and the main red zone threat is HOF candidate TE Tony Gonzalez. The passing attack with test the Ravens pass defense, ranked 9th in the NFL. Baltimore has gotten a huge boost from the return of safety Ed Reed, who loves to ball-hawk, who has three interceptions in just two games. The Ravens have been susceptible to the run, with opponents averaging 4.2 yards per rush, and Turner will test the edges of their defense. Watch Thursday Night Football Live Online Streaming right from your computer Sign Up Here. The Ravens finally own their own dangerous passing attack led by Joe Flacco (1,917 yards, 12 TDs), Anquan Boldin (40 catches, 5 TDs), and Derrick Mason (30 catches, 399 yards). The Baltimore running game has faltered at times, but Ray Rice and Willis McGahee have come-on strong the past few games. Atlanta possesses a top-10 run defense so the Ravens may have trouble finding consistent running space this week. Look for the Ravens to pass, especially off of play action on first down, since Atlanta’s pass defense has averaged 250 yards against with 13 TD passes allowed. Atlanta can intercept the ball, though, and Flacco is prone to the big mistake. NFL Week 10 Picks Atlanta has a slight edge in this game and plays well at home (4-0). If the Falcons can get scores quickly, they should defeat the Ravens. If Baltimore slows the game down, the Falcons will fall. Look for Atlanta to push the pace, cover the Las Vegas Odds, and win the ball game. NFL Week 10 Predictions Atlanta Falcons. Make the call on this NFL Week 10 Odds matchup between Baltimore Ravens vs Atlanta Falcons at Betus.com and receive 100% Sign Up Bonus from one of the top online sportsbooks. Put Some extra cash in your bankroll this week to make your NFL Predictions Bets.